Weed-smothering clumps of large light green leaves, unspotted, are preceded in very early spring by clustered heads of coral-red tubular flowers. Categories: Featured Plants, M-P, Plants A-Z, Plants by Season, Plants In Situ, Spring, Summer, The Cool Border, The Cottage Garden, The Spinney Walk, The Woodland Walk. 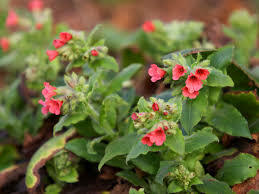 Providing valuable ground cover towards the front of a partially shaded bed or woodland garden, the light green foliage and deep coral coloured flowers that appear from late winter make this a very attractive semi-evergreen perennial. Lift and divide large clumps every three to five years after flowering or in autumn. Cut back plants affected by mildew to the ground, water and feed – the plant will regenerate and produce new leaves later in the year.